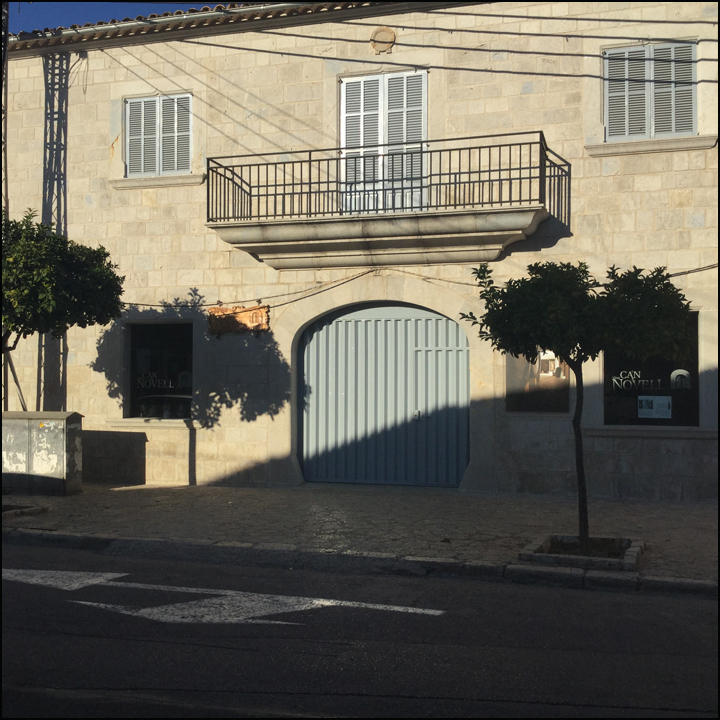 Inconspicuously situated on a small urban street in the heart of Binissalem, entering Vins Ca’n Novell is like going back in time to when locals and expats came from all over the island to refill bottles and stock up on wine for their meals. 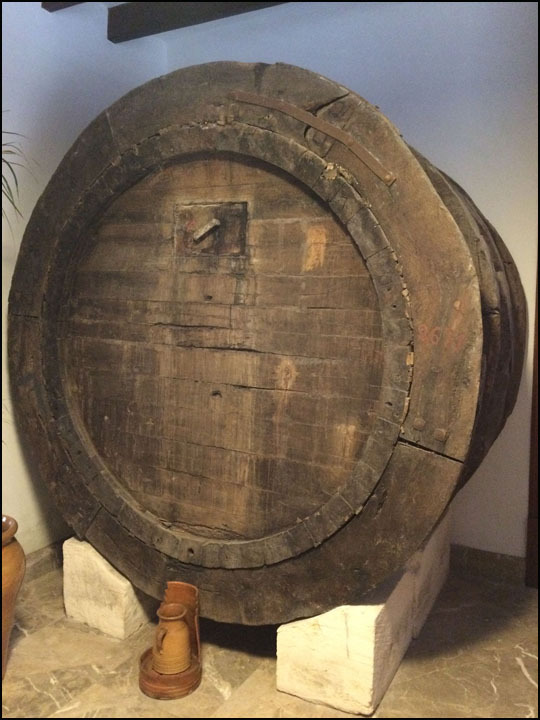 Ancient and enormous wooden casks line the back wall, wine-soaked and full of bulk wine on tap. Also for sale, old-fashioned multi-liter glass bottles with rubber baskets are available so you can reuse instead of wasting or recycling! Vins Ca’n Novell also has sealed bottle production of their wines, with 12 different labels; and tastings are available here too. This bodega is over 100 years old that they know of, with a current astonishing production of around 100,000 bottles per year. 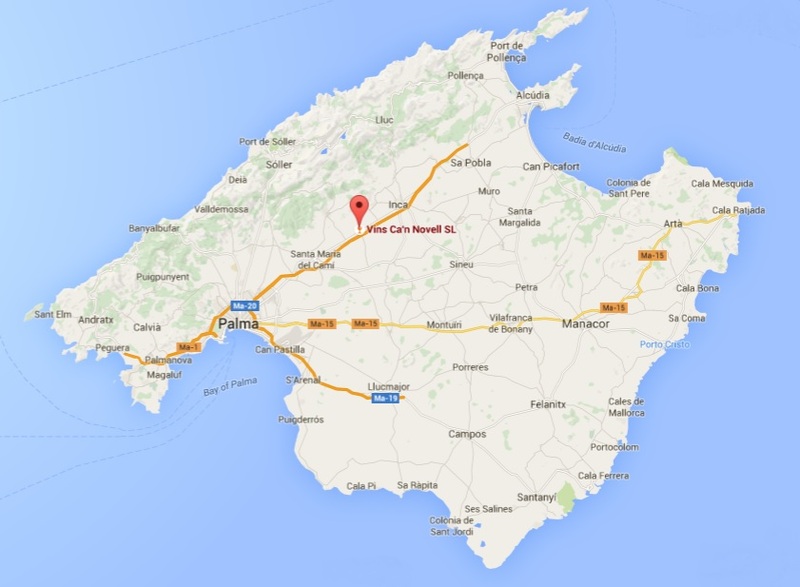 They are located not far from the larger José Ferrer and Tianna Negre wineries, but Vins Ca’n Novell is a blast from the Mallorcan past in comparison! They seem not to be a part of the D.O. Binissalem – they were here before it existed and are conducting business as usual! 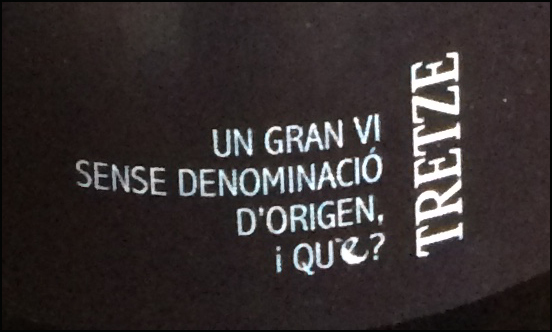 Translation: A great wine without Denomination of Origen…and so what? Hot and coming from a tasting, we went in search of water in Binissalem and stumbled onto Vins Ca’n Novell. In the short time that we were there, village people came by moped, bike, or car to pick up their daily wine. Standing wide eyed, we were greeted by a man as he rushed past us, full of smiles and life. “Have you been helped?” he called. It was none other than owner Andreu Villalonga. We excitedly asked for a tasting and a short tour – we were cutting it close with our next tasting scheduled in ½ hour; Andreu was in a hurry too, and jumped immediately into talking with passion about his wine! He showed us all the 12 different wines he makes on the display table, and then without hesitation went into the refrigerator and happily exclaimed “Let’s try the white!” We loved it! Then he asked us what we thought the price was…and to our surprise! Very few Euros!! Great wine at an incredible price! Lovely to see such enthusiasm, Andreu was bubbling with enjoyment for Mallorcan wine. He told us that the majority of his wines are made with local grapes, and showed us that all the labels are in Mallorquin – like the Chardonnay labeled Xardoné (the x in Mallorquin is pronounced like the ch in English). So special! Fourth generation in this family, Andreu told us he was unable to actually stop work and tour us, yet he opened several bottles and poured splashes into lovely tiny bar glasses, and then ran us around the operational back introducing us to all! Andreu told us that their “de granel” = “bulk wine” is the same quality and taste as that wine when bottled. Quickly we were whisked along into the back rooms where bottles were being cleaned and labeled, vans were loading, work in progress! Andreu told us that they box and store the cases of bottles at controlled temperature, allowing aging there, and never sell a case before its time. He introduced us to a pair of men waiting patiently for him. One of them was a Friar here to return empty bottles. This winery reuses all the bottles you bring back, at the time of this writing: 1 Euro for 12 bottles! That is incredible considering that at the time of this writing, their wines are all well under ten Euros/bottle! Andreu buys the bottles, cleans and reuses them, rather than buying new or recycling the glass, which he says makes the most sense to keep costs and waste down – and 300 Colombian kids eat because of this Friar’s return efforts! Kindness and environmental awareness in action, beautiful! In the far back of the sprawling building, we came to what is probably the formal entrance and office area. Cool, quiet, with beautiful stone floors, antique winemaking tools stand on display beside an enormous 200 year old olive wood cask that was still used for bulk wine until just recently. Here Andreu told us they had a huge tour of young Americans coming that weekend and he would feed them and pair his wines out at their nearby vineyard, then bring them back there for a tour. He said it would be a really fun group and he was looking forward to it. His joy was contagious. He invited us to join them, but stupidly neither of us managed to get away from real-life that day. Now we’re thinking we need our heads examined! Vins Ca’n Novell is both funky and pretty, functioning and hopping. 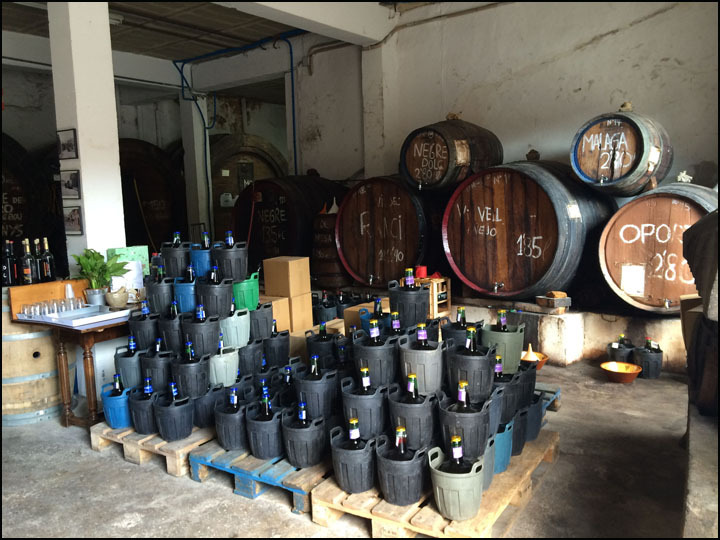 It’s a bodega with your daily table wine, made by locals and for everyone’s table! Come one, come all! 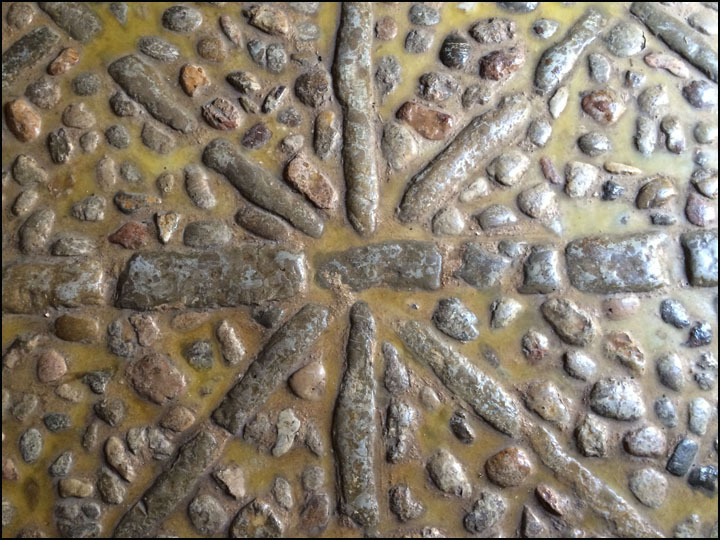 When you get to Binissalem on the old Inca/Palma road, at the streetlight, turn towards the city center following the city center sign. This is the street that leads you directly to the plaza with the church on it. About three quarters of the way into the city center you will see the bodega on your right. Ca’n Novell! Had a fabulous time at the wine tasting. Just sitting at home in the Midlands England having a glass of vi negre dolc which we managed to bring back in our luggage! I want more….